Annually, after wide consultation, I provide a list of people I think Northern Ireland would be better off without. Since the object of this exercise is not to depopulate the place dangerously, I’ve had to rule out such sweeping suggestions as “all Stormont MLAs and their Spads”, “anyone with more than one woodchip boiler”, “all rude anti-Brexiteers” and “anyone who begins a sentence on the radio with the word ‘So'”. There’s also the problem that some of those who most deserve to be run out of town have been expelled before and turned up again as bold as brass and just as offensive. For instance, Martina Anderson MEP and Ian Paisley MP were ‘deported’ in the recent past at least twice, but were back offending in 2018. So I’ve had a rethink and realised there is no point in expulsion for its own sake – there has to be a programme of re-education. This year I’m proposing a pilot experiment, with Ms Anderson and Mr Paisley by popular command the main guinea pigs. Coming from someone who served 13 years for conspiracy to cause explosions and refuses to apologise, it was a remarkably brazen euphemism. I had intended to send Ms Anderson – who is one of the most virulent Israel-haters in Sinn Fein – to live in a vulnerable town in that country in fear of her life from rocket attacks and violent incursions through the border fence. And I was busy seeking a holiday location for Mr Paisley in a particularly Spartan corner of the Congo, when I realised that I had to expand my remit. This duo will be with smaller fry also in need of rehabilitation. There is Jude Collins, the blogger whose craving for attention this year included his lengthy apologias for the killers of Mary Travers in 1984 and the Omagh bombers in 1998 on the grounds that they had been reckless and inefficient rather than murderous. Naomi Long gets there for services to sanctimony. Then there is Secretary of State Karen Bradley, who for the sake of not rocking the boat is endorsing a legacy deal that ticks all Sinn Fein’s boxes. This select gathering will be transported to a dreary location without sunshine or fine dining. There will be no opportunity for Ms Anderson, Mrs Long and Mr Paisley to take the innumerable selfies of which they are so fond, and Ms Bradley will have no civil servants. In this reality show the five will be stuck with each other every day and all day, except when being interrogated by some of the roughest interviewers in the business, starting with Andrew Neil. The TV audience will vote after each interview on which failings have been exhibited most glaringly. Lengthy discussions with a succession of pastors will ensue, followed by more rough interviews and votes. No one gets out until they have written revealing essays reflecting on their past transgressions and their weaknesses, and have displayed humility, self-knowledge, contrition and a determination to mend their ways. 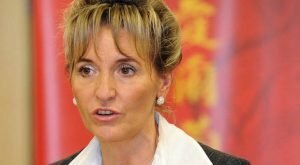 Ms Anderson will stop rewriting history; Mr Paisley will give most of his salary to the poor; Mr Collins will voluntarily renounce commenting; Mrs Long will stop sneering at those who dislike the progressive agenda, and Ms Bradley will rush back to the office and tear up the legacy proposals.